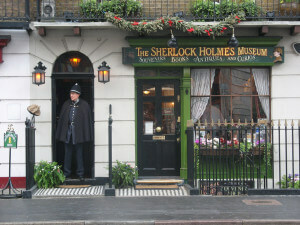 On a recent visit to London, Anna and I decided it would be fun to visit the Sherlock Holmes Museum, situated, naturally, at 221b Baker Street. Like, it seems, the majority of the UK, we both love Arthur Conan Doyle’s intriguing character and all of the stories and mystery that surrounds him. We weren’t quite sure what to expect from a museum dedicated to a fictional man, but both found it quite an enjoyable experience. 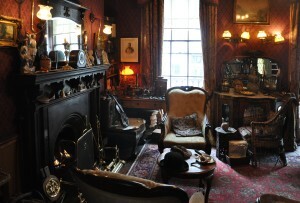 It is a house decorated just like Sherlock lives there, with a (creaky-floored, and slightly magical) gift shop on the ground floor. It’s rather fun to look around and spot items you recognise from various Conan Doyle stories. Of course, there are also a selection of pipes and deerstalker hats for you to pose with for fun photos in Sherlock’s living room! Most interesting of all for Anna and I were the contents of a folder on display in a spare room (displayed underneath a more-than-slightly unnerving bust of the Hound of the Baskervilles). 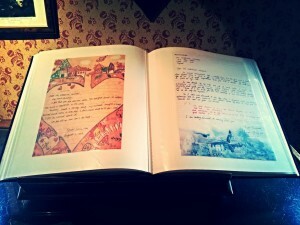 Inside this large folder were letters written to Sherlock by fans – many handwritten in pen. 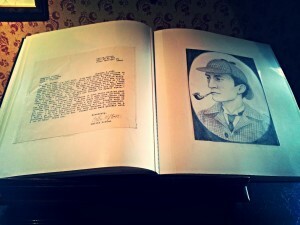 Never before had I considered that people might write letters to Sherlock Holmes; a fascinating phenomenon that has been occurring since Doyle’s very first stories were published. Some believed he was real, and refused to believe otherwise. Some, I imagine, knew he was fictional but couldn’t resist the lure of penning him a letter anyway. Whichever belief camp fans were in, they wrote, and they wrote in their masses… and they still do now! The BBC’s Sherlock series will no doubt have had a large impact on reviving the stories again; keeping Sherlock alive in our hearts and minds. Over the years the Nation’s most famous detective has received marriage proposals, job queries from potential new housekeepers, drawings, requests for autographs, and, as you’d expect, many appeals for help with solving crimes. 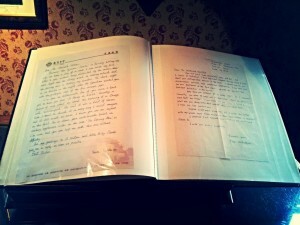 These letters have always been answered; firstly by Doyle, and later by the Sherlock Holmes Museum, with a few others in-between. I was glad to learn this fact, as I did read one letter in the museum outlining how the writer’s husband had arrived home recently with a large knife and she was concerned about her safety; it made me wonder if there was any truth behind it, and if there was, why she was writing to a fictional detective and not immediately calling the Police! When researching this article, I came across a book for sale on this very subject: Letters to Sherlock Holmes, by Richard Lancelyn Green. If you’re interested in this curiosity, Green’s book seems to have had good reviews. I may add it to my Christmas list this year! When you consider how few letters are handwritten and sent nowadays, compared to the past, and how people also send letters to the fictional Juliet of Shakespeare fame, it puts Sherlock’s obvious and undying popularity into a very clear perspective. The nation truly loves Sherlock Holmes.